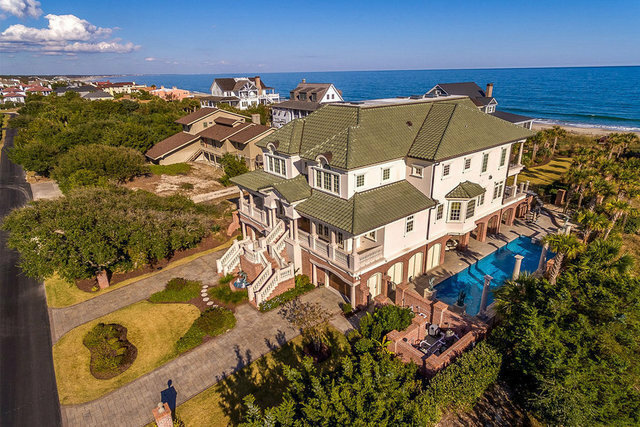 This magnificent island estate boasting exquisite details that elevate it to an elite class is located oceanfront in the private gated community of DeBordieu Colony, just north of the historic port city of Georgetown, SC. This fully custom-built residence boasts over 15,000+ total square feet with an open spacious floor plan and features a catwalk gallery with spectacular artwork. With 5 bedrooms, 6 ½ baths, impeccable craftsmanship is reflected throughout this home with interior features including a chef’s gourmet kitchen with all built-in cabinets, luxury appliances, center island, a walk-in pantry, black walnut hardwood floors, central vacuum system, lighted panel ceilings, and hand painted faux finished walls. In addition, this home has a fitness center, elevator, all custom solid Alder stained doors, 8 skylights with power close screens and rain sensors, security system with cameras, whole house sound system, Apple iPort wall mounted controllers throughout, and a large laundry room with beautiful cabinetry. It further boasts presidential, barrel, vaulted, coffered, and beam ceilings with custom crown molding throughout, 3 fireplaces to keep warm on a cool fall evening, and an impressive entry door. Some exterior features include columns made from imported Brazilian marble at the grand entrance, stucco siding with brick veneer, a terra cotta roof, high impact windows and doors, professional landscaping, and a spiral staircase to the picturesque outdoor living spaces. The impressive covered outdoor living space features automatic power screens, a cozy fireplace, large seating area, built-in grill, full wet bar with beer taps and kegerators, and custom cabinetry. The geothermal heated saltwater pool with hot tub features custom columns and bronze sculpture fountains, with plenty of palm trees for a truly tropical feel. Some mechanical features include Geo-Thermal HVAC units with 8 zones, spray foam insulated throughout, and whole house emergency generator. Beautifully chosen custom furniture throughout the home is negotiable. Community features include 18-hole golf course designed by Pete Dye, private beach access, members only access to beach club, boating with 2 boat storage areas, crabbing, fishing, walking and biking trails, plus lots of other outdoor activity opportunities available. Georgetown S.C. is located just north of Charleston, SC and just south of Pawleys Island and Myrtle Beach. Come see this spectacular home in this special piece of paradise.